The Andaman scops owl (Otus balli) belongs to Strigidae, the family of true owls. These owl species are endemic to the Andaman Islands of India. Otus balli is monotypic species. The scops owls, belonging to genus Otus, are generally small, agile birds and are colored in various shades of brown. Allan Octavian Hume named these species after Valentine Ball, an Irish geologist and ornithologist. Otus balli is considered closely related to O. icterorhynchus (sandy scops owl), O. alfredi (Flores scops-owl) and O. spilocephalus ( mountain scops owl). Earlier Andaman scops owl was considered conspecific with O. icterorhynchus. The Andaman scops owl is a small, agile bird, measuring 18 to 19 cm in length. There are two color variants of these birds. One is gray-brown and other is reddish-brown. The facial disc is pale brown. The ear-tufts are prominent and the eye brows are whitish. The large, glassy eyes are pale greenish yellow. The bill is pale yellowish gray. The legs are covered with pale grayish-brown feathers and the feet are gray. The upper parts are comparatively darker than the lower parts. Black vermiculations can be seen on the upper parts. The tail and flight feathers are barred. Their call is a characteristic hooting sound. These Andaman scops owl species roost in trees in semi-open areas, cultivated lands and plantations near human settlements and appear to tolerate disturbances from human activities. These owl species are nocturnal and feed on insects, beetles, insect larvae, especially caterpillars. On spotting a caterpillar on the ground foliage, in a parrot-like fashion, it moves sideways to reach it. The breeding season of these owl species is between February and April. They nest in tree hollows and abandoned woodpecker or barbet holes. These Andaman scops owl species are found distributed in Middle and South Andaman Islands. 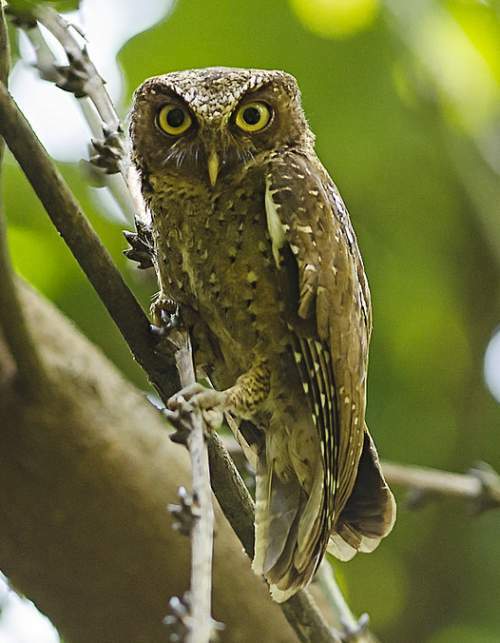 Mr.Balaji Venkatesh Sivaramakrishnan is credited with the scops owl picture in this post (taken in Mount Harriet National Park, South Andaman). He had observed in his Flickr page, "This species is classified as Near Threatened though they are commonly seen in Andaman". These owl species are non-migratory and are endemic resident birds of the Andaman Islands. They may make local movements for feeding and breeding. The global population of these species has not been quantified. The overall population trend is on the decline due habitat loss. Considering the small range of Andaman scops owl, it is inferred that it is "Near-threatened" to extinction. The CITES (the Convention on International Trade in Endangered Species of Wild Fauna and Flora) has listed these species in Appendix II. The IUCN (International Union for Conservation of Nature) has categorized and evaluated these owl species and has listed them as of "Near-threatened". Current topic in Birds of India: Andaman scops owl - Otus balli.